I have a small pile of cut bamboo poles left over from a rather elaborate tomato cage adventure. 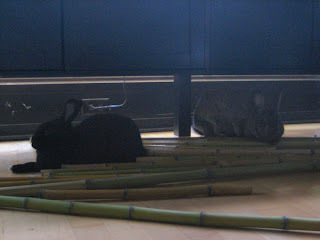 The poles have been stored (i.e., left on the spot where the pile ended up) near the buns' nighttime hangout. About a week ago, the buns started picking up the ends of the poles with their teeth and dropping them on the hardwood floor at precisely 5:45 AM. This is 15 minutes before our alarm clock goes off. At first it was sort of cute; husband and I would squint/groan at the ruckus and get a sleepy giggle out of it. But since we live in one big room, this smashing and clattering has long since grown old. I finally found a place for the bamboo today, out of the little comedy duo's reach. Which is not to say they won't find something else to rattle tomorrow morning, but at least it won't be bamboo poles on an obscenely loud hardwood floor at the crack of stupid o'clock in the morning. Your Bunnies can tell time....how cute! Alarm clocks are bad for the health. I wonder if the bamboo could be "tuned" by making it different lengths and you could have a sort of Rabbit Gamelan, or would that be a Bunelan (you saw that coming...) Bunnies do have an innate sense of time, that is why the White rabbit in Alice in Wonderland has a pocket watch.